Rural communities in the U.S. are facing emerging challenges reflected in the opioid crisis. CDC data show that since 1999 the age-adjusted opioid-related mortality rate increased by 185% in metro areas, 693% in micropolitan areas, and 725% in noncore/rural areas. Trends in rural economic decline are implicated in and affected by the surge of the opioid crisis, but empirical research remains far too limited to inform policy and guide community development. The goal of our integrated research-extension project is to identify and disseminate effective place-based strategies that reduce opioid risks and hazards in rural and micropolitan communities experiencing social disorganization due to economic and farm restructuring. Key outcomes include opioid-related deaths, arrests, and prescribing rates and supply. There are five project objectives. First, to establish a national stakeholder advisory panel on non-metro opioid hazards. Second, to understand how economic restructuring, farm concentration, social disorganization, and government capacity affects opioid hazards across place and time using secondary data and multilevel structural models. Third, to understand effective local responses that increase community resilience or vulnerability to opioid hazards using qualitative case studies in 12 communities. 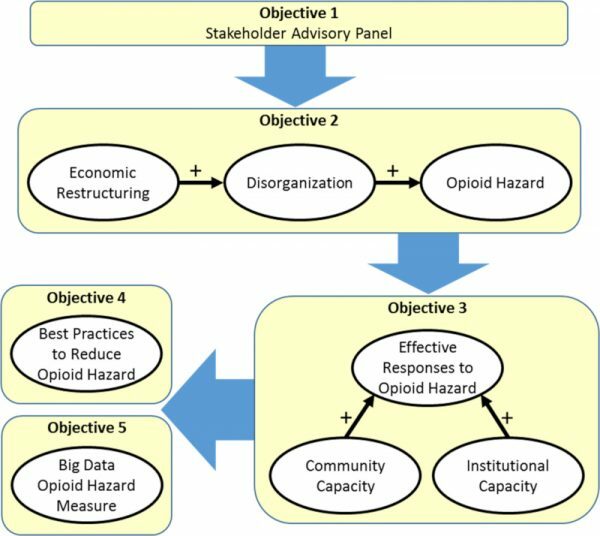 Fourth, identify and disseminate to stakeholders place-based strategies that have been effective at reducing opioid hazards. Fifth, develop and deploy a real-time indicator of local opioid hazards using Big Data methods (web scraping and machine learning). This project addresses the AFRI (A1661) priorities for rural communities, as the opioid crisis is a pressing rural problem that negatively affects economic development, local government and social services, and social inequality. What is the current state of the opioid crisis?